Even I, the Woman-Who-Ingests-More-Butter-Than-Is-Humanly-Possible, like to lighten up a bit after the holidays. There’s the post-baby weight, the pounds I gained for the 12 Days of Cookies series, the additional poundage from Christmas with my family, and finally, the extra weight from having a cold for 10 days and not getting off my arse, except to eat (of course). I needed something for a post-New Year get together recently, and I knew folks might be a little tired of the rich and heavy. This Tiramisu Toffee Angel Cake fit the bill perfectly — feather light but oozing with the creamy espresso flavor, toffee crunch and warm mocha drizzle. Make this. And don’t feel bad. 1. Using a serrated knife, cut angel food cake horizontally into 3 layers. Place 1 cake layer on a serving platter; set other layers aside on a flat work surface. 3. For filling: In bowl of electric mixer, cream together cream cheese, confectioners sugar, and the liqueur until blended and smooth. Spread the top of the cake layer that is on the serving platter with half of the filling mixture. Sprinkle half of toffee bits on top. Place a second cake layer on top of first layer and spread the top with remaining filling. Sprinkle remaining toffee bits on top. Place the third cake layer on top of second cake layer. 4. For frosting: In a small bowl, combine confectioners sugar with the tablespoon of instant espresso. Fold mixture into the thawed whipped topping just until blended. 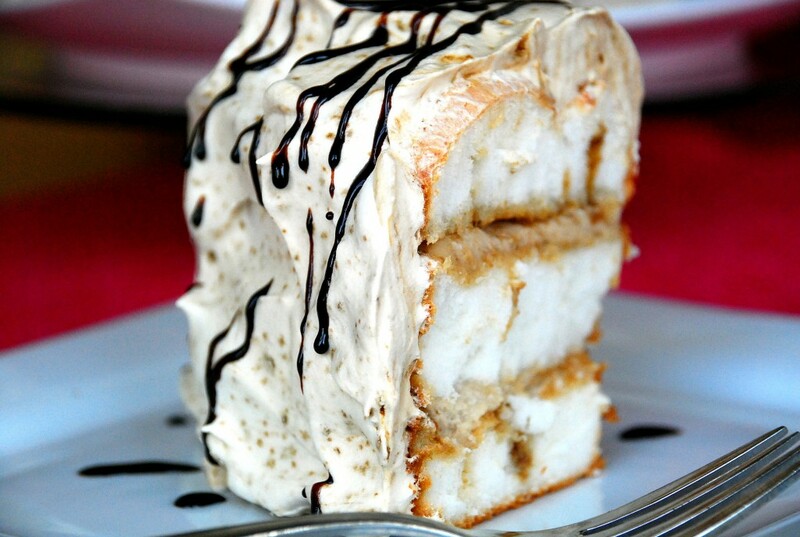 Frost the entire cake with the whipped topping mixture. Chill cake for at least 2 hours. 5. To serve: Before serving, combine fudge ice cream topping and 1 Tablespoon of coffee liqueur. Drizzle over chilled cake. Using a serrated knife, cut cake, making 16 servings.